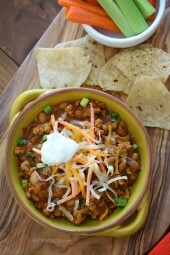 An easy chili recipe with a buffalo chicken twist! So easy to make and SOOOO good – perfect for game watching or any night of the week! 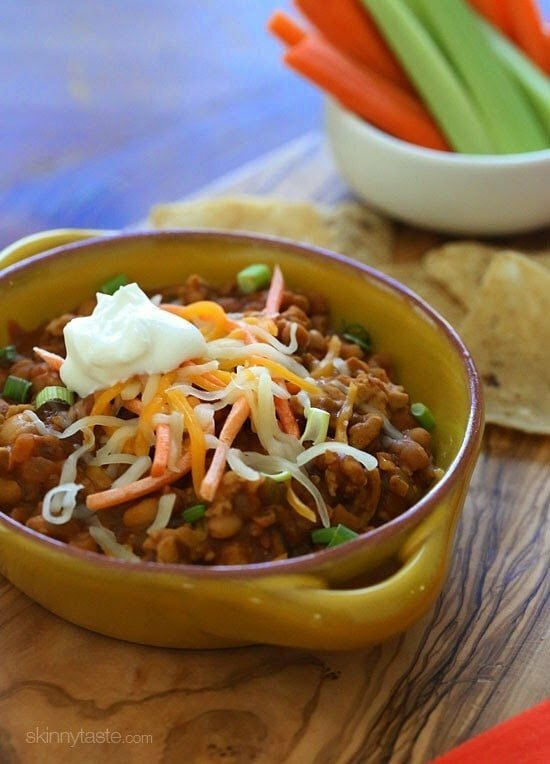 More chili recipes you might enjoy are Jalapeno Popper Chicken Chili, Turkey Chili Taco Soup, and No Bean Turkey and Sweet Potato Chili. And the best part is it doesn’t need to simmer all day. This is ready in about 40-45 minutes, and most of that time is unattended. To thicken the chili and give you that texture like it’s been simmering for hours, I added refried pinto beans to the mix which always works like a charm! I like to serve mine with a handful of chips like Beanitos which are made from white beans, but any baked chip is great and of course, some carrot sticks and celery on the side. Hope you enjoy! This is chili with a buffalo chicken twist! 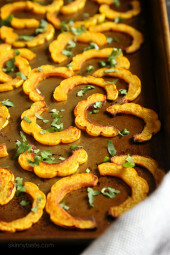 So easy to make and SOOOO good – perfect for game watching or any night of the week! Heat a large deep nonstick skillet over medium-high heat. Brown the ground chicken in the skillet and cook, breaking up the meat into small pieces as it cooks, about 8 to 10 minutes, or until cooked through, set aside. Add the onion, carrot, celery, garlic, chili powder, cumin, paprika, a pinch of salt and pepper, and cook stirring until the vegetables soften, about 5 to 6 minutes. 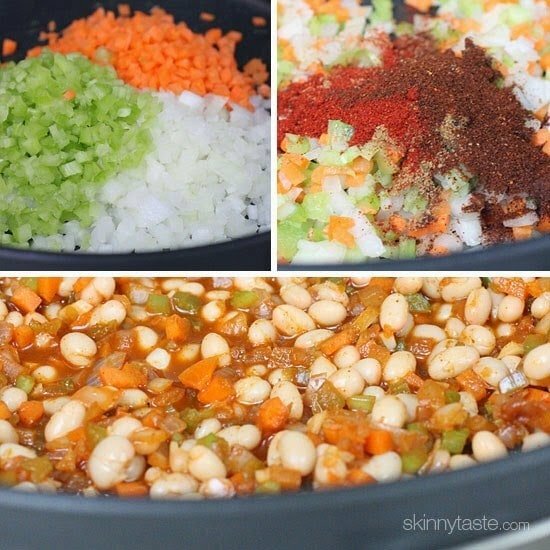 Add white beans, refried beans, water and chicken broth, bring to a boil and simmer covered on medium-low about 10 minutes. Stir in the hot sauce and add the chicken, cover and simmer until thickened, 25 to 30 minutes, stirring occasionally until the flavors blend. This is SOOOO good. I added a Tbsp of crumbled blue cheese and it was a game changer. This is an oldie but a goody. It’s cold and snowy outside and I made this today. I have made it at least a dozen times and it’s delicious. I make sure I keep a can of refried beans on hand. Love this! Used it as part of a low saturated fat diet. Question: The recipe lists 0 saturated fat, is that correct? I would think the meat has some. Thanks for your great recipes, they always have great flavor! I put the ingredients in the new SP calculator and it looks like everything that gave this chili SmartPoints in the past is now 0 points. This chili is the best! Just made this for lunch and yes, it was so good and so filling! I follow weight watchers so I really appreciate the low points for this meal! Thank you Gina! This is quite possibly one of the best chillies I’ve made or eaten. So much flavor. I changed this ever so slightly based on what I had on hand (Used a 24 oz. can refried pinto beans and all chicken broth, no water, increasing to 2 cups to compensate for the extra beans. Lastly, doubled the spices – I like it HOT.) And, wow. This will be on the frequent rotation in our house for sure. I have a really bad habit of not fully reading the directions on a recipe before I get started, so I ended up sauteing my veggies in with the chicken. They ended up a bit crunchy, (totally my fault) but the chili is amazing! I will definitely make this again and it will be a go to wheb I’m craving wings! This is one of my favorites to make. You can make it as spicy as you like it. It’s great for cold weather. Another perfect chili, and one that satisfies buffalo sauce craving is a plus!! As a red meat lover, I’ve found I prefer chilis with turkey or chicken over beef. Nothing feels lacking and the flavor is so good. Save the red meat for steaks and burgers ???? Would this be zero weight watcher freestyle points? This is still one of my faves! Hi Gina, This is one of our favorites, but confused how it is still 5 Freestyle points? I used 99% fat free ground chicken and fat free refried beans… where do the 5 points come from? Thank you so much! Thanks! It’s 3 SP. It would be 0 with 99% chicken. Has anyone converted this to Instant Pot yet? Do you know the freestyle points for this recipe?? Thank you!! I have been making this chili for years now. It is the hit of all parties I take it to, as well as one of my most requested dishes. It is easy to make and you can make it the day before as the flavors will blend even more. I am making this today for a pre-thanksgiving pot luck at work tomorrow. I always make extra so there are plenty of leftover for lunch the next day for my co-workers. Love this chili ! Made this today and it was a hit. So yummy. I omitted the celery and put very little red hot and it was still good. The refried beans base gave it a great flavor. I was making chili for a crowd, so I doubled the recipe and added ground chicken AND chicken thighs. I also did it in my Instand Pot of slow cooker for 6 hours. It was a huge hit. Very flavorful and everyone really loved it, even my uncle who is fighting dementia told me how awesome it was. 🙂 Thank you! Oh, I also added a can of tomatoes. Is it 3/4 cup of chicken stock or 3-4 cups? How would you do this in a slow cooker? Or is it better over the stove? Its so quick, stove works but it would be fine in the slow cooker. My new favorite chili recipe!! Love this so much! Tastes so much more indulgent than it is. Thanks for the great recipe! I made this tonight and it was delicious!!! I am loving your recipes. I haven’t made one that I haven’t loved! Thank you so much for sharing! Hi. I love this recipe. How would you do this in an electric pressure cooker.? I’m slowly learning how to cook and your recipes are so easy to follow! This is delicious. I used turkey and it still tastes awesome. Though I think I missed a step because mine turned out really really think. Just made this and it’s sooo delish! Instead of ground chicken I used the crockpot buffalo chicken from your buffalo chicken lettuce wraps and added fire roasted diced tomatoes. Amazing! Definitely keeping it in the recipe line up this fall/winter. Thanks Gina! This is one of my favorite recipes. Thank you! If I don’t like beans is there anything you recommend subbing for them? I made this last night and it was soo good! My husband and brother and law loved it too. I also made some cornbread to eat with it. Delish!! I just made this today and it is incredible! Thank you for so many amazing recipes! Just made this. Followed the recipe exactly. It was AMAZING. The best chili I've ever had. Really loved this! Made it last week and making it again this week. 🙂 Thanks! We made this last night, and it was delicious, we added a can of crushed tomatoes, and it gave it a stew like taste and consistency, I was skeptical about refried beans, but it turned out very good. We make this regularly and its ridiculously good. Easy to make, no prep really. It's super filling and delicious!! Thank you! This was Great!!! I am not the biggest on chili but had decided I wanted to make some with ground turkey I needed to use up from the freezer. Used a regular can of fat free refried beans which was my only substitute.They were a great way to thicken and flavor but I did have to add double the liquid to allow it to simmer without drying out. Would add more hot sauce but I like that it is not the same old buffalo flavor, it was a bit more complex. Perfect mix between buffalo and chili! Might be my new go to chili recipe! Thanks! 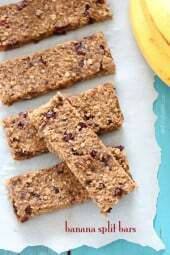 I'm new to the site and just discovering Gina's recipes. On this one – WOW. 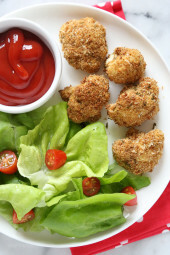 Buffalo flavor, no frying, super easy, and delicious? I'm overjoyed. Eight tablespoons of Frank's for me. I just made it – for lunches this week – and my only complaint is that I can't stop eating it and there won't be anything left for lunch! Someone get me away from this pot! Mine is simmering right now. Doubled the recipe and doubled again the spices plus I through in a jalapeno. I used ground turkey….it smells and tastes very good and easy to make. Especially with the pre diced onion, carrot and celery packages from Trader Joes. This should last me the week! I've made this once a week since you posted it back in September, I'm addicted!! I usually eat it during the week for a quick lunch as it's very filling. I like all of your recipes but this one really has me hooked. Doubled this for a World Series potluck last night and EVERYONE loved it! Not as much left over as I was hoping. It was so easy and quick to make! Thanks! GO GIANTS! Eating this as I write this….YUM! SO great! Thanks for another awesome recipe! I just won a work chili cook off with this recipe! Thanks for the free movie tickets Gina! Made this last night and LOVED it. Used my crockpot on low for 6 hours. I couldn't find the exact refried beans this called for, so I just bought a can of low-fat black refried beans and added them. Perfect! It's warm, but I wouldn't say spicy or even Hot. OMG I made this recipe over the weekend and it was AMAZING!!! I was completely amazed at how the refried beans thickened the chili the way it did! It had such WONDERFUL flavor and was super easy!!! The only thing I would change is limit the Franks to 3 tbsp because for me and my guy it was a bit too much but not overwhelming…..Next time I'll definitely be doubling this wonderful recipe and adjusting the heat!!! Spot on, Gina!!! You've done it again as always!!!!! Thanks so much for all you do!!! any suggestions for cooking this in the crockpot? I'm a one star-Thai kind of guy, and 6 TB of Frank's was perfect. Would love to see a crockpot version of this, so I could easily double the recipe. Sooo delicious! It makes me sad to see those that eliminated the hot sauce entirely, the hot sauce is what adds the buffalo flavor! Yummy! Definitely add some even if only 1 TBS, it adds a lot of the flavor. 🙂 I added 5 TBS and it was the perfect amount of spicy for me. I made this today for my lunch this week as well! I stole a quick taste and it's awesome!! I don't think it's too spicy. My fiance tasted as well and he's typically pretty picky but he enjoyed it! Thank you for your amazing recipes! I made this tonight to eat for lunch throughout the week. I am glad it's weight watcher friendly, it will help me with my points. Thanks! I was just looking through all the comments to see if others had had luck making it for kids and I think I'll just try it and cut down a little on the Franks for the kids' sake! it looks yummmy! This rated 5 stars at our house. I did cook it a tiny bit longer to get the carrots good and done. Very good. Will make a lot more times for sure! Made this last night. I would DEFINITELY suggest you start with 3-4 TBSP of Franks, taste, and then add from there. I went all in with 6 TBSP and it was hot hot hot! Additionally, I did three large shredded chicken breasts, and other than that, FANTASTIC recipe! I made this in the crockpot yesterday and turned out great! I didn't add all the hot sauce as I'm not a fan of too spicy stuff, but I could have and it would have been fine. Probably should have added a bit more liquid as well, but it's still delicious. Was just wondering what would be a substitute for the buffalo chicken. Tofu? or the morningstar product that fakes chicken? Adding vegetables makes the chili flavorful..but adding beans may not. Any suggestions? I made a version of this yesterday using no meat and my pressure cooker. I added a can of low sodium diced tomatoes. Some chopped cilantro as well as two teaspoons of red pepper flakes (cuts sodium) instead of hot sauce. I also doubled the beans (as I was not using meat) and spices. I like it hot. Someone asked if white beans have a different name and it is White Kidney or Cannellli. Thanks for all of your great recipes. do white beans go by another name? This was SO good!!! I love hot, but my husband does not, so only added 1 tablespoon of hot sauce…but it was still unbelievable! I've never made anything bad from your recipes – they are always delicious!! Made this today and it tastes great! I don't care for celery so instead added a small can of corn, and also a small can of jalapenos for a little kick. Worked out really well. Many chefs say we eat with our eyes first which I believe is true because my mouth is watering and my nose is thinking it smells this cooking. This is a must try for this weekend. I just cooked my ground chicken and veggies in the skillet. Now everything is slow cooking on low in the crockpot (I adore my crockpot)! I used sriracha in stead of hot sauce because that's what I had in the cabinet. I only used 3 tbsp. I love this website so much. I literally ate myself to skinny by making 2-3 recipes a week for my meal preps. Down 50lbs since October 2013! Thank you Gina for continuing to provide us with healthy, delicious, and easy-to-make recipes! Hi I was wondering how long you cooked it in the crockpot? You browned the meat first i’m guessing? Yes, I think 6 hours on low is good. We made one day and ate it the next evening and it was DELICIOUS! It is is our regular rotation of recipes now. Many of them yours… Enough so I'm feeling guilty and am going to Amazon now to pre order your book! Thanks so much for sharing your recipes. They're always wonderful! I made this tonight (minus the Hot sauce) It is great. My husband asked me to save the recipe for future meals. I would give this a 10 out of 10 for flavor and texture. Made this for dinner tonight…yummy! Whole Foods just opened yesterday in Palm Desert, Ca. so I was able to find, your refried beans and beanitos. Without hot sauce it was plenty spicy for us. It got so thick I actually had to thin out with more chicken stock. Using refried beans to thicken was brilliant. Looking forward to leftovers tomorrow night. Thanks, Gina…. Wonderful, so glad you liked it!! I only have chicken breast in the fridge. Would love to try this tonight. Do you think that work, too?? Sure, you can simmer it in the broth for 20 minutes, then shred it. Any ideas on how to cut the sodium? Hot sauce has a lot of sodium unfortunately, the only suggestion I could make is adding ground cayenne in place of the hot sauce. Or replace the broth with water. This looks delicious! Do the recipes in your new cookbook show Points Plus as well as "ol points" for them? No, only the full nutritional info but you can use your calculator to determine the pints. I looooooove your buffalo chicken wraps and buffalo chicken dip, I can't wait to try this one! Thanks Gina! Update – made it this weekend and it was great! The only thing I changed was I used chicken breast and let it simmer with the broth as Gina suggested – delicious! I love, love chili but it's so nice to have something a little different!